Vin Diesel received perhaps the greatest cake ever made for his 48th birthday this past weekend. At this point, it's pretty much common knowledge that Vin Diesel is one of the coolest guys in Hollywood. And while some of his awesome factor obviously comes from his acting ("I am Groot" anyone? ), he also scores some serious nerd cred for his love of traditionally geeky past times like tabletop role-playing and, more specifically, Dungeons & Dragons. 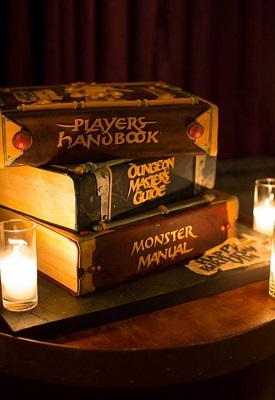 For those not in the know, Mr. Diesel celebrated his 48th birthday this past weekend, an event that prompted his friends and loved ones to gift him with a Dungeons & Dragons-themed cake that we can only describe as the greatest piece of baking the world has ever seen. Designed to look like a stack of 3rd Edition D&D books -the Player's Handbook, Dungeon Master's Guide and Monster Manual- its accuracy and detail are nothing short of astounding. Had you not told us this was a cake, our eyes, at first glance, might have sincerely mistaken it for actual books. We currently don't know who made the cake, but we're willing to bet they've been investing more than a few skill points into their culinary skills. The real madness, of course, is the fact that people presumably cut into this cake and ate it. We don't know about you, but we'd honestly feel kind of bad ruining a masterwork of this caliber. In fact, if we were Vin Diesel we'd feel a little angry at whoever gave this to us. It's gorgeous and all, but eating this would make us feel guilty and cake should never inspire guilt.